Tinea corporis is a superficial dermatophyte infection characterized by either inflammatory or noninflammatory lesions on the glabrous skin (ie, skin regions other than the scalp, groin, palms, and soles). Three anamorphic (asexual or imperfect) genera cause dermatophytoses: Trichophyton, Microsporum, and Epidermophyton. Dermatophytes may infect humans (anthropophilic) or nonhuman mammals (zoophilic), or they may reside primarily in the soil (geophilic). Infections due to zoophilic or geophilic dermatophytes may produce a more intense inflammatory response than those caused by anthropophilic microbes. Patients who are immunocompromised or infected with the human immunodeficiency virus (HIV) often have atypical presentations, including deep abscesses or a disseminated skin infection. This variant of tinea corporis is a fungal infection of the hair, hair follicles, and, often, surrounding dermis. Typically caused by Trichophyton rubrum, it manifests as perifollicular, granulomatous nodules typically in a distinct location, which is the lower two thirds of the leg in females, with an associated granulomatous reaction. Majocchi granuloma often occurs in females who shave their legs. This variant is a dermatophyte infection spread by skin-to-skin contact between wrestlers [2, 3] ; it often manifests on the head, neck, and arms, which is a distribution consistent with the areas of contact in wrestling. Another variant of tinea corporis, this form is found mainly in Southeast Asia, the South Pacific, Central America, and South America. Tinea imbricata is caused by T concentricum  and is recognized clinically by its distinct, scaly plaques arranged in concentric rings. A potassium hydroxide (KOH) examination of skin scrapings, used to visualize fungal elements removed from the skin's stratum corneum, may be diagnostic in tinea corporis. A fungal culture, which is often used as an adjunct to KOH for diagnosis, is more specific than KOH for detecting a dermatophyte infection. Therefore, if the clinical suspicion is high yet the KOH result is negative, a fungal culture should be obtained. For atypical presentations of tinea corporis, further evaluation for HIV infection and/or an immunocompromised state should be considered. A skin biopsy specimen with hematoxylin and eosin staining of tinea corporis demonstrates spongiosis, parakeratosis, and a superficial inflammatory infiltrate. Neutrophils may be seen in the stratum corneum, which is a significant diagnostic clue. On occasion, septate branching hyphae are seen in the stratum corneum with hematoxylin and eosin stain, but special fungal stains (eg, periodic acid-Schiff, Gomori methenamine silver) may be required. Topical therapy is recommended for a localized infection because dermatophytes rarely invade living tissues. Topical azoles and allylamines show high rates of clinical efficacy; these agents inhibit the synthesis of ergosterol, a major fungal cell ̶ membrane sterol. The topical azoles inhibit the enzyme lanosterol 14-alpha-demethylase, a cytochrome P-450–dependent enzyme that converts lanosterol to ergosterol. Inhibition of this enzyme results in unstable fungal cell membranes and causes membrane leakage. Tinea corporis is a superficial dermatophyte infection characterized by either inflammatory or noninflammatory lesions on the glabrous skin (ie, skin regions except the scalp, groin, palms, and soles). Three anamorphic (asexual or imperfect) genera cause dermatophytoses: Trichophyton, Microsporum, and Epidermophyton. Dermatophytes may infect humans (anthropophilic), infect nonhuman mammals (zoophilic), or reside primarily in the soil (geophilic). Dermatophytes preferentially inhabit the nonliving, cornified layers of the skin, hair, and nail, which is attractive for its warm, moist environment conducive to fungal proliferation. Fungi may release keratinases and other enzymes to invade deeper into the stratum corneum, although typically the depth of infection is limited to the epidermis and, at times, its appendages. They generally do not invade deeply, owing to nonspecific host defense mechanisms that can include the activation of serum inhibitory factor, complement, and polymorphonuclear leukocytes. Following the incubation period of 1-3 weeks, dermatophytes invade peripherally in a centrifugal pattern. In response to the infection, the active border has an increased epidermal cell proliferation with resultant scaling. This creates a partial defense by way of shedding the infected skin and leaving new, healthy skin central to the advancing lesion. Elimination of dermatophytes is achieved by cell-mediated immunity. Tinea corporis can be caused by a variety of dermatophytes, although prevalence and patient history are very helpful in identifying the most likely organism. Internationally, the most common cause is T rubrum. T tonsurans, Trichophyton mentagrophytes, [5, 12] Trichophyton interdigitale, Trichophyton verrucosum,  Microsporum canis, and Microsporum gypseum  are also known to produce infection. Tinea imbricata is caused by Trichophyton concentricum. Dermatophytoses may be acquired from different sources, such as people, animals, or soil. Infected humans are the most common source of tinea corporis in the United States. Contact with contaminated household pets, farm animals, and fomites (eg hair brushes, towels) can spread infection. T verrucosum causes 98% of dermatophyte infections in cattle and is showing increasing prevalence of infection in human contacts. T mentagrophytes is spread by rabbits, guinea pigs, and small rodents. Infection with M gypseum, a geophilic organism, can mimic tinea imbricata in presentation. Because fungal arthroconidia can survive in the environment, recurrent outbreaks may occur. Tinea corporis occurs in both men and women. Women of childbearing age are more likely to develop tinea corporis as a result of their greater frequency of contact with infected children. Tinea corporis affects persons of all age groups, but prevalence is highest in preadolescents. Tinea corporis acquired from animals is more common in children. Tinea corporis secondary to tinea capitis typically occurs in children because tinea capitis is more common in this population. For localized tinea corporis, the prognosis is excellent, with cure rates of 70-100% after treatment with topical azoles or allylamines or short-term or pulse systemic antifungals. Dermatophyte infections do not result in significant mortality, but they can greatly affect quality of life. For patient education resources, see the Skin, Hair, and Nails Center. Also see the patient education article Ringworm on Body. Pires CA, Cruz NF, Lobato AM, Sousa PO, Carneiro FR, Mendes AM. Clinical, epidemiological, and therapeutic profile of dermatophytosis. An Bras Dermatol. 2014 Mar-Apr. 89(2):259-64. [Medline]. [Full Text]. Adams BB. Tinea corporis gladiatorum. J Am Acad Dermatol. 2002 Aug. 47(2):286-90. [Medline]. Ilkit M, Saracli M, Kurdak H, et al. Clonal outbreak of Trichophyton tonsurans tinea capitis gladiatorum among wrestlers in Adana, Turkey. Med Mycol. 2009 Oct 14. [Medline]. Sun PL, Ho HT. Concentric rings: an unusual presentation of tinea corporis caused by Microsporum gypseum. Mycoses. 2006 Mar. 49(2):150-1. [Medline]. Sanchez-Castellanos ME, Mayorga-Rodriguez JA, Sandoval-Tress C, Hernandez-Torres M. Tinea incognito due to Trichophyton mentagrophytes. Mycoses. 2007 Jan. 50(1):85-7. [Medline]. Seyfarth F, Ziemer M, Gräser Y, Elsner P, Hipler UC. Widespread tinea corporis caused by Trichophyton rubrum with non-typical cultural characteristics--diagnosis via PCR. Mycoses. 2007. 50 Suppl 2:26-30. [Medline]. Leyden J. Pharmacokinetics and pharmacology of terbinafine and itraconazole. J Am Acad Dermatol. 1998 May. 38(5 Pt 3):S42-7. [Medline]. Singh S, Shukla P. End of the road for terbinafine? Results of a pragmatic prospective cohort study of 500 patients. Indian J Dermatol Venereol Leprol. 2018 Jun 8. [Medline]. Singh A, Masih A, Khurana A, Singh PK, Gupta M, Hagen F, et al. High terbinafine resistance in Trichophyton interdigitale isolates in Delhi, India harbouring mutations in the squalene epoxidase gene. Mycoses. 2018 Jul. 61 (7):477-484. [Medline]. Sardana K, Kaur R, Arora P, Goyal R, Ghunawat S. Is Antifungal Resistance a Cause for Treatment Failure in Dermatophytosis: A Study Focused on Tinea Corporis and Cruris from a Tertiary Centre?. Indian Dermatol Online J. 2018 Mar-Apr. 9 (2):90-95. [Medline]. Mapelli ET, Borghi E, Cerri A, Sciota R, Morace G, Menni S. Tinea corporis due to Trichophyton rubrum in a Woman and Tinea capitis in her 15-Day-Old Baby: Molecular Evidence of Vertical Transmission. Mycopathologia. 2011 Oct 14. [Medline]. Shiraki Y, Hiruma M, Matsuba Y, et al. A case of tinea corporis caused by Arthroderma benhamiae (teleomorph of Tinea mentagrophytes) in a pet shop employee. J Am Acad Dermatol. 2006 Jul. 55(1):153-4. [Medline]. Placzek M, van den Heuvel ME, Flaig MJ, Korting HC. 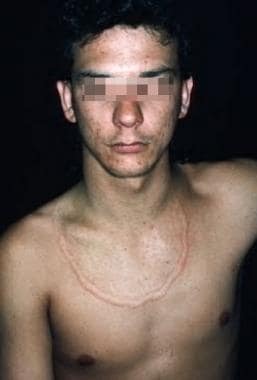 Perniosis-like tinea corporis caused by Trichophyton verrucosum in cold-exposed individuals. Mycoses. 2006 Nov. 49(6):476-9. [Medline]. Foster KW, Ghannoum MA, Elewski BE. Epidemiologic surveillance of cutaneous fungal infection in the United States from 1999 to 2002. J Am Acad Dermatol. 2004 May. 50(5):748-52. [Medline]. Carod JF, Ratsitorahina M, Raherimandimby H, Hincky Vitrat V, Ravaolimalala Andrianaja V, Contet-Audonneau N. Outbreak of Tinea capitis and corporis in a primary school in Antananarivo, Madagascar. J Infect Dev Ctries. 2011 Oct 13. 5(10):732-6. [Medline]. Hryncewicz-Gwózdz A, Beck-Jendroschek V, Brasch J, Kalinowska K, Jagielski T. Tinea capitis and tinea corporis with a severe inflammatory response due to Trichophyton tonsurans. Acta Derm Venereol. 2011 Oct. 91(6):708-10. [Medline]. Seyfarth F, Goetze S, Erhard M, Burmester A, Elsner P, Hipler UC. [Infection with a rare geophilic dermatophyte.]. Hautarzt. 2009 Aug 14. [Medline]. Yehia MA, El-Ammawi TS, Al-Mazidi KM, Abu El-Ela MA, Al-Ajmi HS. The Spectrum of Fungal Infections with a Special Reference to Dermatophytoses in the Capital Area of Kuwait During 2000-2005: A Retrospective Analysis. Mycopathologia. 2009 Nov 17. [Medline]. Dhib I, Khammari I, Yaacoub A, Hadj Slama F, Ben Saïd M, Zemni R, et al. Relationship Between Phenotypic and Genotypic Characteristics of Trichophyton mentagrophytes Strains Isolated from Patients with Dermatophytosis. Mycopathologia. 2017 Jun. 182 (5-6):487-493. [Medline]. Ziemer M, Seyfarth F, Elsner P, Hipler UC. Atypical manifestations of tinea corporis. Mycoses. 2007. 50 Suppl 2:31-5. [Medline]. Kim HS, Cho BK, Oh ST. A case of tinea corporis purpurica. Mycoses. 2007 Jul. 50(4):314-6. [Medline]. Romano C, Massai L, Strangi R, Feci L, Miracco C, Fimiani M. Tinea corporis purpurica and onychomycosis caused by Trichophyton violaceum. Mycoses. 2009 Sep 22. [Medline]. Weinstein A, Berman B. Topical treatment of common superficial tinea infections. Am Fam Physician. 2002 May 15. 65(10):2095-102. [Medline]. Chatterjee D, Ghosh SK, Sen S, Sarkar S, Hazra A, De R. Efficacy and tolerability of topical sertaconazole versus topical terbinafine in localized dermatophytosis: A randomized, observer-blind, parallel group study. Indian J Pharmacol. 2016 Nov-Dec. 48 (6):659-664. [Medline]. Choudhary S, Bisati S, Singh A, Koley S. Efficacy and Safety of Terbinafine Hydrochloride 1% Cream vs. Sertaconazole Nitrate 2% Cream in Tinea Corporis and Tinea Cruris: A Comparative Therapeutic Trial. Indian J Dermatol. 2013 Nov. 58(6):457-60. [Medline]. [Full Text]. Liebel F, Lyte P, Garay M, Babad J, Southall MD. Anti-inflammatory and anti-itch activity of sertaconazole nitrate. Arch Dermatol Res. 2006 Sep. 298(4):191-9. [Medline]. Brooks, M. FDA Approves New Topical Antifungal Luliconazole 1%. Medscape Medical News. Available at http://www.medscape.com/viewarticle/814470. Accessed: November 18, 2013. Luzu (luliconazole topical cream 1%) [package insert]. Bridgewater, NJ: Valeant Pharmaceuticals North America LLC. February, 2018. Available at [Full Text]. Mahajan S, Tilak R, Kaushal SK, Mishra RN, Pandey SS. Clinico-mycological study of dermatophytic infections and their sensitivity to antifungal drugs in a tertiary care center. Indian J Dermatol Venereol Leprol. 2017 Jul-Aug. 83 (4):436-440. [Medline]. Schreuder MF, van de Kar NC, Brüggemann RJ. Drug-Drug Interactions in Treatment Using Azole Antifungal Agents. JAMA. 2016 Jun 21. 315 (23):2622. [Medline]. Chen S, Ran Y, Dai Y, Lama J, Hu W, Zhang C. Administration of Oral Itraconazole Capsule with Whole Milk Shows Enhanced Efficacy As Supported by Scanning Electron Microscopy in a Child with Tinea Capitis Due to Microsporum canis. Pediatr Dermatol. 2015 Oct 8. [Medline]. da Silva Barros ME, de Assis Santos D, Soares Hamdan J. Antifungal susceptibility testing of Trichophyton rubrum by E-test. Arch Dermatol Res. 2007 May. 299(2):107-9. [Medline]. Wingfield AB, Fernandez-Obregon AC, Wignall FS, Greer DL. Treatment of tinea imbricata: a randomized clinical trial using griseofulvin, terbinafine, itraconazole and fluconazole. Br J Dermatol. 2004 Jan. 150(1):119-26. [Medline]. Majid I, Sheikh G, Kanth F, Hakak R. Relapse after Oral Terbinafine Therapy in Dermatophytosis: A Clinical and Mycological Study. Indian J Dermatol. 2016 Sep-Oct. 61 (5):529-33. [Medline]. Tinea corporis. Courtesy of Wikimedia Commons (https://commons.wikimedia.org/wiki/File:Tinea_corporis.png). Dermatophytosis or ringworm with mildly raised boarder and central clearing. Courtesy of Wikimedia Commons [James Heilman, MD] (https://commons.wikimedia.org/wiki/File:Yeartinfection.JPG). The authors and editors of Medscape Reference gratefully acknowledge the contributions of previous authors Mary Elizabeth Rushing Lott, MD and Gwendolyn Zember, MD, to the development and writing of this article.